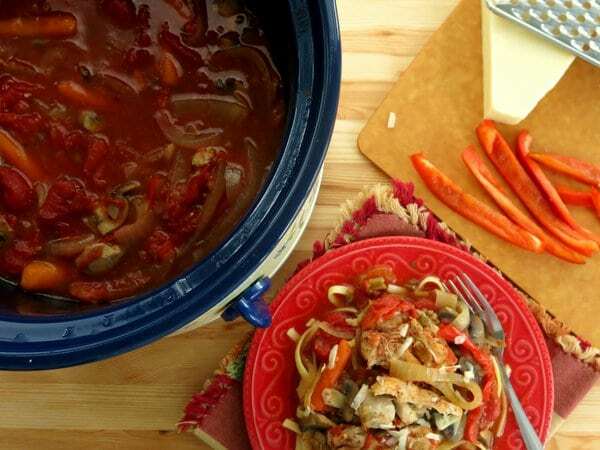 Simple Crock Pot Chicken Cacciatore with onions, peppers, mushrooms and carrots is slow cooked in a flavorful tomato sauce. It’s an easy and healthy comfort meal. Transitioning from fun holiday activities back to a busy work/school schedule can be a tough pill to swallow…at least at our house. Any time of year, but especially this time of year, I really appreciate the flexibility and ease of a crock pot meal. It’s ready when we are ready. (Soccer practice runs late. No problem. Dinner is still ready to go when we get home.) It accommodates conflicting schedules too. (I literally sit down to dinner twice on some nights!) Most importantly, the house is full of inviting aromas…and a kind of warmth that is comforting as you move into the New Year. Who can resist a nice warm meal after coming in out of the cold?! It’s no wonder that the most viewed recipe on The Dinner-Mom site in 2013 was a slow cooker one… Crock Pot Baked Ziti! 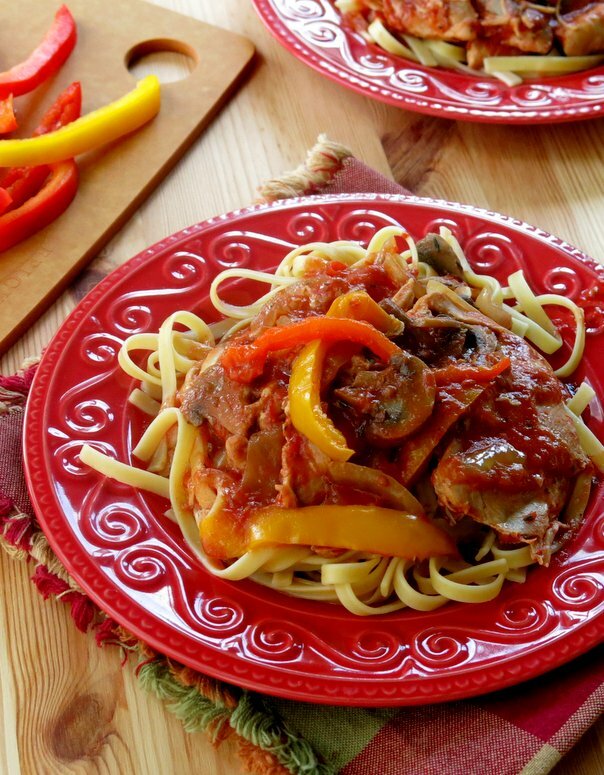 This crock pot chicken cacciatore recipe has evolved over time. It’s got your basics: chicken, onions and peppers. But, I also “hunt and gather” other vegetables lurking in the refrigerator. My favorite additions are mushrooms and carrots. To be honest, I’m not much of a pepper person, but my hubby is. So, I compromise and add red peppers that are just a bit sweeter than the green variety. Finally, stewed tomatoes have replaced crushed or diced tomatoes in this dish because they give a sweet flavor boost to the tomato sauce. 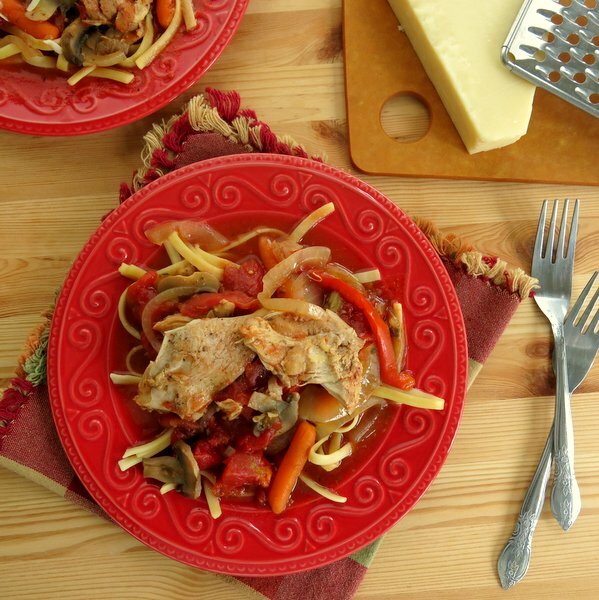 Serve crock pot chicken cacciatore over linguine or rice or polenta or whatever suits your fancy or dietary restrictions. What comes out of the crock pot is healthy, gluten-free and delicious…and perfect for a healthy transition to the New Year. 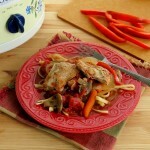 Crock Pot Chicken Cacciatore with onions, peppers, mushrooms and carrots is slow cooked in a flavorful tomato sauce. It's an easy and healthy comfort meal. Brown chicken for about 3 minutes on each side. Add chicken, onions, peppers, carrots and mushrooms to crock pot. Mix tomatoes, garlic, oregano and red wine vinegar together. Pour tomato mixture over chicken and vegetables and stir slightly to allow tomato mixture to coat vegetables and chicken. To thicken sauce, remove chicken to serving platter and keep warm. Mix together corn starch and water and then stir into sauce remaining in the crock pot. Return chicken to crock pot or pour sauce over chicken on serving platter. If desired, serve with pasta of choice cooked according to instructions and Parmesan cheese. Leave out carrots, use canned diced tomatoes (with less than 3g of sugar per servicng) and use arrowroot instead of corn starch to keep recipe South Beach Phase 1 compliant. Also, serve without noodles or over zucchini zoodles. This looks and sounds delicious. I love all of the veggies in it and cooking in the slow cooker is a big plus! Can’t wait to try it. Happy Sunday Marjorie. I’ve never ever made Cacciatore and can’t think of a better way to ease into a new recipe than using my crockpot. Nice cooking with you for Sunday Supper. I never thougth of chicken cacciatore in the Crock-Pot! Great recipe! Looks just amazing!! I think this one is going on the list for this week!! Nothing like throwing in a bunch of veggies and some chicken! Thanks for sharing. I love your “hunt and gather” reference! Sounds so much better than scour for leftover veggies, like I do! Have a great New Year Marjory! SO gorgeous on the red plates!!! And just as delicious as beautiful, I’m certain! The slow cooker sure is a life saver! I’m heading over to check out your Crock Pot Baked Ziti now too! You’re absolutely right, now is a great time for slow cooker recipes. It sure is nice to have a healthy, low carb, versatile dish like this in your back pocket – anytime! Thanks for sharing & HUGS! This looks so tasty and warm on a cold day, I will have to try it soon! Thanks for sharing! I love how classic dishes like this one can be made in the crockpot – making for much less clean up and hassle for us doing the cooking! This is a beautiful dish, perfect for a yucky weather day like today. I love chicken cacciatore. I’m so lucky – my crock pot insert is actually stovetop safe! So, I could brown the chicken right in it, then transfer to the slow cooker. Will be making this recipe soon, for sure! I love all of the veggies in this dish! I looks amazing and is easy to make during a busy weekday! I love how you incorporated so many vegetables in this one dish. It looks great! 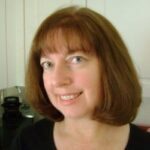 A few of my most popular recipes were slow cooker ones! And this one sounds fabulous. I am a chicken thigh girl, too! So colorful and full of flavor, that is on my menu for tomorrow night!!! Amazing what can be made in a slow cooker these days. What a lovely meal full of flavor and veggies too. And tomato-y dishes like this get me every time. I absolutely love this recipe and intend to make it for dinner this week. It will freeze beautifully if we don’t finish it all. We are only 2. I love the beautiful dish featured here. Would you tell me what it is and where I could purchase some? It is absolutely grand. It does freeze beautifully. The plates were a gift…I am always on the hunt for food photography props! But, they are my favorite plates and you will see them often on the site these days. 🙂 Thanks for stopping by!